I have already said that I love salmon and I try to eat it often since it's so good and healthy. 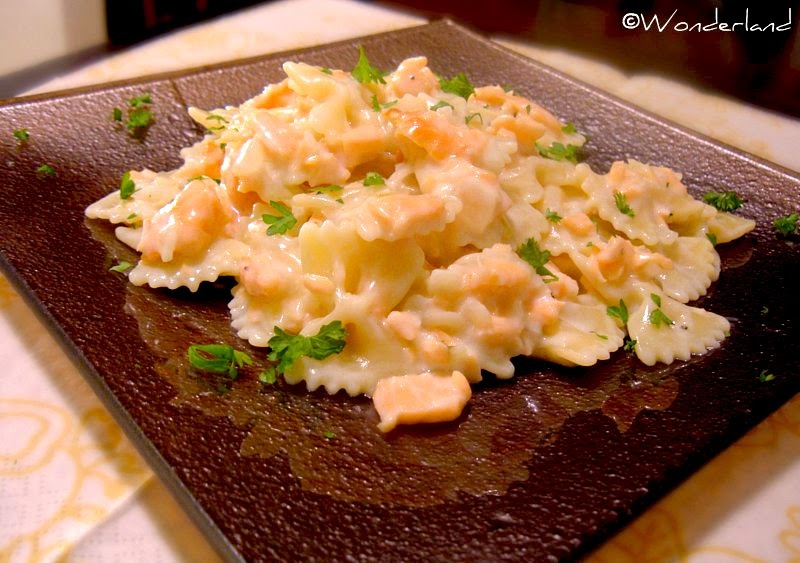 Our top favorite salmon recipe is smoked salmon pasta: delicious and easy to make! I cook it almost every week. On the internet you can find many salmon pasta recipes, but I always cook it the Italian way... very very simple. Italian foods are simple and tasty because they are made with few but good raw ingredients. In this recipe I use a little bit of dry vodka. It might sound weird, but it does really give a good taste and goes well with the salmon. Slice the salmon in small stripes. Finely chop the onion and saute it in a saucepan with oil over medium heat. When it becomes soft, add the salmon and let it cook for few minutes, adding black pepper and, if needed salt, up to taste. Pour the vodka and let the alcohol evaporate for few minutes stirring well. Add the cream, stir, and let the sauce cook for few minutes at low heat so it gets thicker. Cook the pasta in salty water until al dente. Mix the pasta with the sauce and serve with fresh chopped parsley on top.